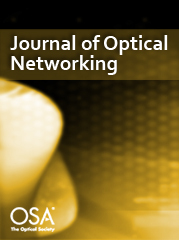 <p><a href="http://www.osa-jon.org/virtual_issue.cfm?vid=28">Feature Issue on Nanoscale Integrated Photonics for Optical Networks</a></p>Fast-reconfigurable integrated switch fabrics utilizing semiconductor optical amplifiers are reviewed in the context of their scaling properties for power-efficient and low-latency switched optical interconnects. The low-power-penalty operation of ultra-compact integrated switches with wavelength multiplexed payloads is assessed. Extrapolations are made through simulation to explore performance in high-connectivity integrated fabrics operating at aggregate capacities of up to 100 Gbit/s per port. Modest intrinsic switch power consumption of the order of milliwatts per gigabits per second per port is predicted with negligible delay at the physical layer. The close agreement with test-bed studies indicates a possible route to high-capacity wavelength-division-multiplexed terabit per second routing with integrated photonic solutions.